Although David had studied the ICND1 text book, his skills were lacking when it came to configuring routers. He had a copy of GNS3 WorkBench, and a copy of the GNS3 Network Simulation Guide, but had not completed all the GNS3 WorkBench exercises, so I sent him off telling him that he should at least complete ALL the ICND1 GNS3 exercises that he had at his disposal. But It occurred to me that I didn’t have a monster exercise that I could give to David to test as many of the ICND1 Exam objectives as possible. So David, I created that monster exercise. I called it the ICND1 Readiness Test. Be challenged! . . 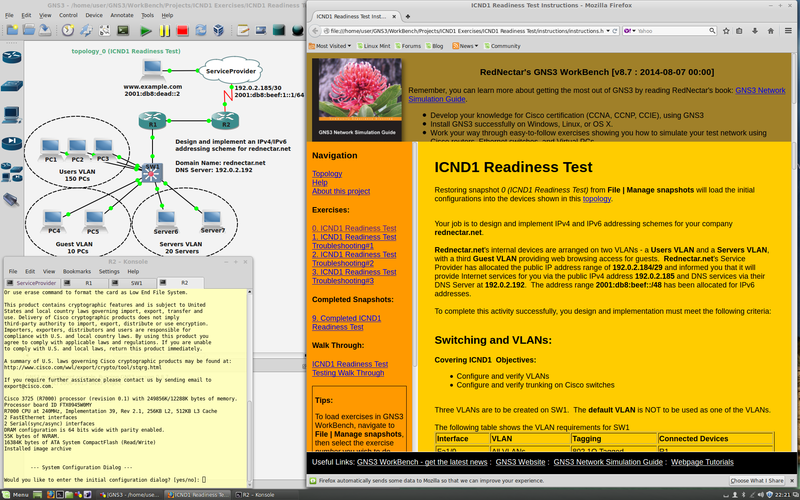 The ICND1 Readiness Test is part of the new v8.7 GNS3 WorkBench distribution. You can download the GNS3 WorkBench exercises (including the ICND1 Readiness Test) to run on your existing installation of GNS3 on your Windows or Macintosh PC here. Or if you want the full bells-and-whistles install, go to this download and follow the instructions to install GNS3 WorkBench on your Linux Mint 17.0 32bit (or Ubuntu 14.04 32 bit system). If you don’t have a Linux system but still want the whole integrated GNS3 WorkBench environment, you can download the GNS3 WorkBench VMware appliance here. Your job is to design and implement IPv4 and IPv6 addressing schemes for your company rednectar.net. Rednectar.net’s internal devices are arranged on two VLANs – a Users VLAN and a Servers VLAN, with a third Guest VLAN providing web browsing access for guests. Rednectar.net’s Service Provider has allocated the public IP address range of 192.0.2.184/29 and informed you that it will provide Internet services for you via the public IPv4 address 192.0.2.185 and DNS services via their DNS Server at 192.0.2.192. The address range 2001:db8:beef::/48 has been allocated for IPv6 addresses. And so on to describe the criteria in relation to the ICND1 exam topics. You can see the full description later in this post. . . If you can complete this exercise within an hour, I’d suspect there’s a good chance that you are ready for the ICND1 exam – although there are other objectives that are not covered here, so you’d need to be sure you have those under control as well. template to create your own exercise. As well as the full configuration exercise, you also get three troubleshooting exercises, each with three items you have to solve. And of course, there is a set of sample completed configurations and a ICND1 Readiness Test Testing Walk Through as well, that describes all the tests you need to do to verify that you have completed the task. Here is the full description of the exercise. If you think you are ready for ICND1, give it a shot! From within the GNS3 WorkBench environment, restoring snapshot 0 (ICND1 Readiness Test) from File | Manage snapshots will load the initial configurations into the devices shown in the topology. Rednectar.net‘s internal devices are arranged on two VLANs – a Users VLAN and a Servers VLAN, with a third Guest VLAN providing web browsing access for guests. services via their DNS Server at 192.0.2.192. The address range 2001:db8:beef::/48 has been allocated for IPv6 addresses. Three VLANs are to be created on SW1. The default VLAN is NOT to be used as one of the VLANs. The management IPv4 address of SW1 is to be assigned to the Users VLAN – see below. The Users VLAN is to be allocated enough addresses to cater for 150 users. The subnet mask used is to be the minimum size to cater for 150 users. The Guest VLAN is to be allocated enough addresses to cater for 10 guests. The subnet mask used is to be the minimum size to cater for 10 guests. The Servers VLAN is to be allocated enough addresses to cater for 20 servers. The subnet mask used is to be the minimum size to cater for 20 servers. You are to determine appropriate address allocations for any remaining subnets required to complete the addressing scheme. The first 10 IPv4 addresses of the Users VLAN subnet are to be reserved (see the DHCP requirements below). The Management Interface of SW1 is to be assigned the second reserved address of the Users VLAN range. The IPv4 address for SW1 is to be assigned to the Users VLAN interface. Router R2 is to be configured to assign DHCP addresses to hosts on the Users VLAN and the Guest VLAN. Hosts in the Guest VLAN are to be given a lease time of 15 minutes. Hosts in the Guest VLAN are to have their IPv4 addresses translated to the IPv4 address of R2’s s0/0 interface. Other servers the Servers VLAN are to have their IPv4 addresses translated to the IPv4 address of R2’s s0/0 interface. Routers R1 and R2 are to be configured to use the OSPF routing protocol. All IPv4 addresses are advertised within rednectar.net’s routed network. Devices on the Servers VLAN have no restrictions. Anyone accessing the console via the console port, or by using ssh is to be forced to login using the admin account. All passwords are to appear encrypted in the running configuration. This device is the property of rednectar.net. All unauthorised access is prohibited. Console, telnet and ssh sessions are to timeout after 15 minutes. Configurations must be saved before leaving the console session. The address range 2001:db8:beef::/48 has been allocated for IPv6 addresses. You are to design an IPv6 addressing scheme to satisfy the requirements a completely dual-stacked network in rednectar.net’s domain. Router R1 is to be assigned a static IPv6 address of your choice. Interface Fa0/0 is to be assigned a static IPv6 address of your choice. Routers R1 and R2 are to be configured to use the OSPFv3 routing protocol. 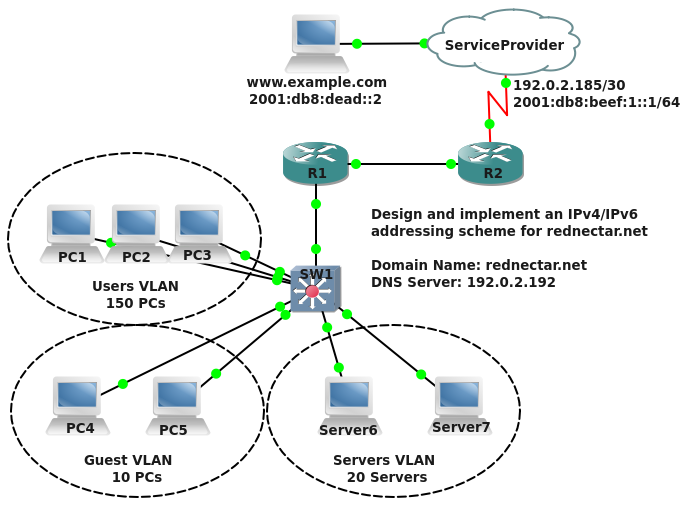 All IPv6 addresses are advertised within rednectar.net’s routed network. No devices on the Users, Guest or Servers VLAN should see OSPFv3 Hellos. To test external connectivity INTO rednectar.net’s network, use ping commands from VPC 9 (the http://www.example.com server) to rednectar.net’s public IP addresses. To test your configuration thoroughly, use the link to the ICND1 Readiness Test Testing Walk Through as a guide. Want to help others find this post? The more people who share the post and give it a 5 star rating, the easier it becomes to find on Google! This entry was posted in Cisco, dynamips, GNS3, GNS3 WorkBench and tagged CCNA Exam, CCNA Questions, CCNA Test, Certification, Cisco, Cisco Systems, Dynamips, GNS3, GNS3 WorkBench, ICND1 Exam, ICND1 questions, ICND1 Readiness Test, ICND1 Test. Bookmark the permalink. Hey Chris, first let me say that this is the most fantastic preparation tool EVER for my CCNA! Thanks so much for investing the time. Thanks so much for your kind words. I hope this helps you get through the exam! If YOUR config doesn’t work that way, you can see the completed configs by browsing to the configs directory in the snapshots directory structure. That’s just it. Even the completed snapshot has the issue. I thought maybe I did something wrong so I saved my snapshot and loaded your completed one. Same issue! If I choose udp or tcp ping it works on all, but icmp pings only work on one VPCS, the one with the static NAT. Possibly the IOS or something I’m not thinking of? Which IOS are you using? I know that c3725-adventerprisek9_ivs-mz.124-15.T14 image has a problem with NAT. Possibly others too. Hey, no worries man! I WAS using c3725-adventerprisek9_ivs-mz.124-15.T14 and then I switched to c3725-advipservicesk9-mz.124-25d just to test. Same issue. NAT using a pool fails to ping www.example.com. Switching the users VLAN to NAT using S0/0 with overload works fine. Crazy. Thanks for the comment. I didn’t think a second about the possibilty of setting up a host-address on the DNS server! My goal & passion is to help people learn. If you learned something from this I’m happy! Note: The given prefix (/30) for the segment between R2 and the ISP only allows 2 IP addresses. Anyone attempting this should use a /29 prefix to allow room for the extra 3 IP addresses required for the NAT requirements. Totally agree. Actually you can force with an ip route command and keep a /30 mask. Also, DNS server address needs to be changed to 192.0.2.193 at least as 192.0.2.192 would be a subnet address in this type of config. This should indicate to you that the serial interface on R2 should have a mask of /30 – and therefore an IP address of 192.0.2.186. I even toyed with the idea of leaving the ServiceProvider cloud with NO IP address, instead getting its IP via SLIP meaning that the lab wouldn’t work if you couldn’t figure out that R2 should be 192.0.2.186/30. But I decided that that was beyond ICND1, so I didn’t implement it that way. But I do expect you to figure out the 192.0.2.186/30 by yourself. You can assume that since the SP has allocated 192.0.2.184/29, then the ServiceProvider cloud has a static route to the 192.0.2.184/29 space via 192.0.2.186. DNS server address needs to be changed to 192.0.2.193 at least as 192.0.2.192 would be a subnet address in this type of config. As for IP 192.0.2.x IP addresses outside of the 192.0.2.184/29 space you know nothing – except that the DNS is 192.0.2.192. You should NOT make the assumption that it should be any other address other than what you have been told, and you had better not try telling the Service Provider that it should change the IP of its DNS!!! :) I guess that for ICND1 level, you would EXPECT 192.0.2.192 to be a subnet address, but if the service provider decides a block of addresses are going to be used as host addresses (with /32 masks) then it ain’t necessarily so. And this is the case here. The DNS IP is in fact an IP address assigned to a loopback with a /32 mask!